Halloween is just around the corner, which means one thing: lots of sweets and treats. However, while the children are guzzling down their prize winnings of the night, the parents are petrified by what monsters might be skulking in the depths of their mouths. To make Halloween a little less frightening for you this year, here are a few suggestions on avoiding any horrid cavity nightmares. Instead of allowing your children to gorge on treats throughout the day, dedicate a time where they can munch on their sweets. That way, sugar is in contact with teeth for a small period of time. If your child continuously eats throughout the day, their teeth are at higher risk of cavities as they are constantly bombarded with sugar for a longer duration of time. The best time to do this would be soon after mealtime when there is an increased saliva production. This helps to neutralise the acids caused by bacteria as well as washing away any food debris that might linger in their mouths. Your children are going to be eating a lot of sweets, which isn’t going to be kind on their bodies, let alone their teeth. Cook a vegetable-rich meal to make up for the bad foods they’ll be eating at ‘treat time’. Although you want your child to have a full Halloween experience, there’s no denying that you might be a little sceptical about what they are putting into their bodies. No child wants to have a ‘healthy treat’, so why not be selective with what they eat? Some sweets can do more damage to your teeth than others, so instead of saying ‘no’ to all sweets, just avoid certain ones such as hard sweets like lollipops that may cause the teeth to chip or break. Sticky sweets such as gummy sweets and sticky caramels are another type of treat you might want to avoid giving your children as they are likely to get stuck between the teeth, making it harder to wash away when it comes to brushing and flossing before bed. A better alternative would be chocolate-based sweets that are quick and easy to eat and are fairly easy to lift from the teeth. There is going to be a lot of sweets and treats during Halloween, so don’t offer your child fizzy drinks. Instead, encourage them to drink only water. Fizzy drinks are a major culprit in causing cavities and damaging teeth, as well as this, water helps to lift and wash away any food debris that may linger between teeth. · Take about 18 inches of floss and ask your children to wrap the floss around both middle fingers, leaving an inch of floss. You may need to help your child do this. · Using the index fingers and thumbs, your child should guide the floss down the gaps between the teeth until it reaches the gum line. Makes sure that the floss is held taut at all times. · From there, they should curve the floss around each tooth in a ‘c’ shape, sliding the floss up and down the side of the teeth. 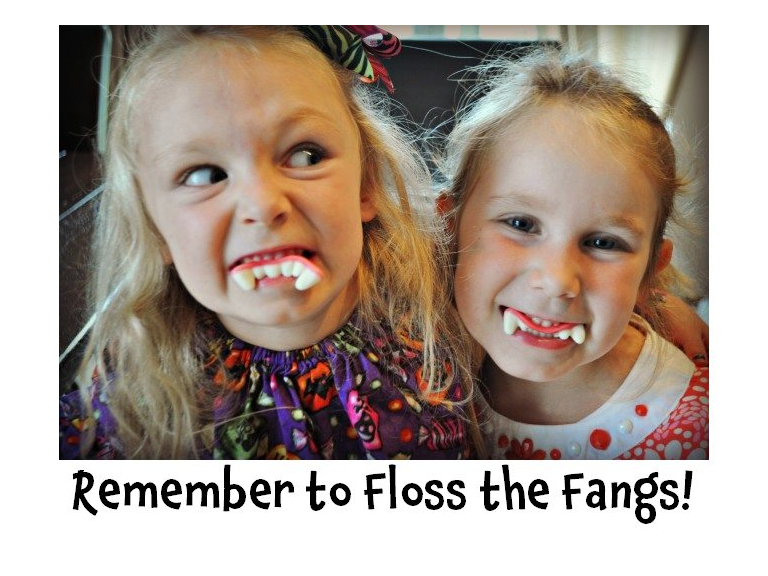 · Repeat this motion with each gap, making sure that your child uses a fresh part of floss each time.